The state of New Mexico is mostly a high desert environment with many rivers, the most prominent of which is the Rio Grande. Spring is in the air .. green is everywhere. Breathe deep, for the desert comes with riparian entertainment! New Mexico is a high desert environment that has many rivers running through it. The most prominent river is the Rio Grande which runs the length of the state from north to south. There are several tributaries that feed into it, and most are also dammed creating lakes and reservoirs. I was fortunate to visit most of these and to paddle on two of them. During my time living in northern New Mexico, I spent much quality time on Cochiti Lake – a dam reservoir on the Rio Grande and also Abiquiu Lake on the dammed Rio Chama. As a Floridian transplanted to this four season high desert, I was determined to make my kayak touring a year round sport! Brown hues of the desolate Rio Grande in the dead of the dry New Mexican winter. Ice breaking on the Rio Grande! Soaking in the winter sun in the high desert of northern New Mexico! New Mexico is also a sunny kind of place – winter, spring and all year round! Because of the high altitude and all the radiant solar heat during the day it’s quite warm and comfortable. The air is light at this altitude, in the winter it feels sterile, like breathing from a SCUBA tank. It’s also silent as can be! In the spring the dry brown hues of winter give way to vibrant greens and fields of beautiful wildflowers! All the new spring growth releases scents that waft through the air along with the sounds of life scurrying around. There are excellent spring time white water paddling opportunities, but I wanted a slower touring pace to focus on photography and continue to “get to know these places”. Fresh green growth on the Rio Grande in northern New Mexico. ART of the Rio Grande – Anthropomorphic magic forms and Riparian voices. There are many side streams on the river. Although mostly dead ends, they are lovely in the springtime! The Rio Grande flows south past Bandelier Nat Monument and pools at Cochiti Lake courtesy of the Cochiti Dam. 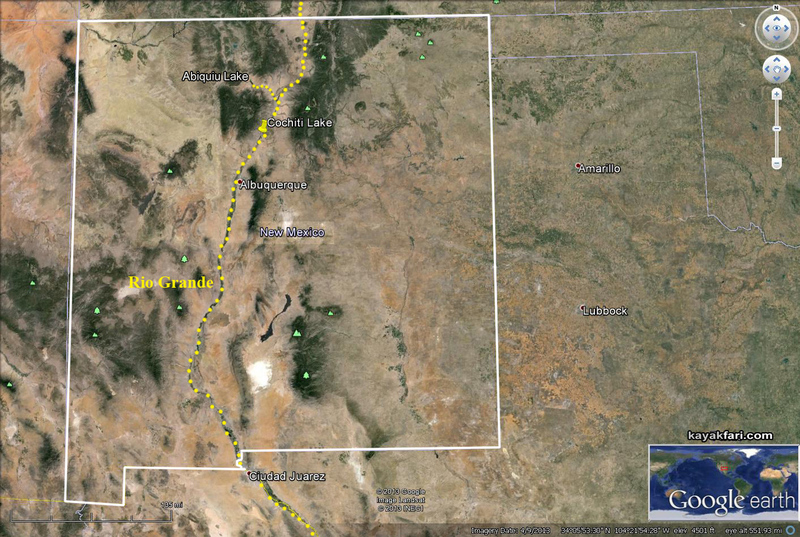 Living in Santa Fe, New Mexico, the closest large body of water is Cochiti Lake, about 20 miles due west as the crow flies from the city. It is actually a part of the Rio Grande and was constructed for flood control and irrigation needs. 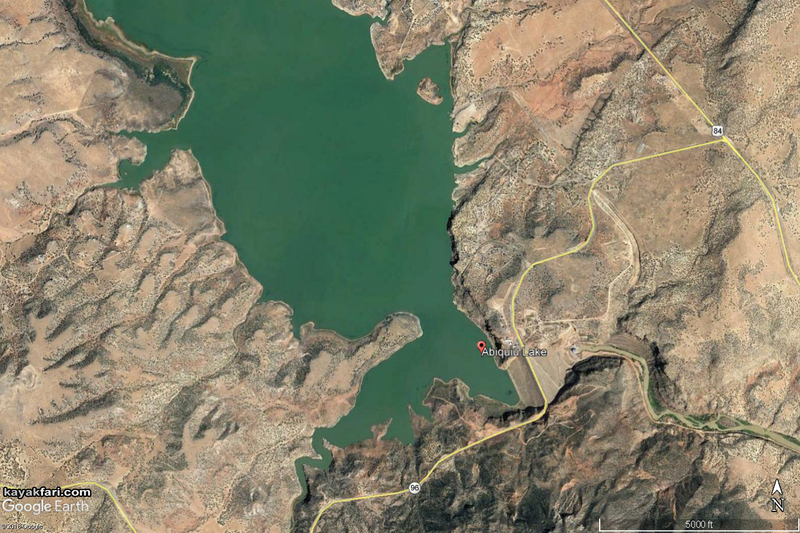 As you can see in the google earth image, agricultural fields start immediately past the earthen fill dam. There are two boating access points, both on inclined paved ramps. The east side on the Tetilla Peak Recreation Area and is seasonal access only in the summer months. The other, bigger ramp is on the west shore called the Cochiti Recreation Area and open year round. The lands surrounding the “lake” are property of Cochiti Pueblo, which is one of several Native American Pueblos in New Mexico. Cochiti Lake on the Rio Grande has two public boating access points. Springtime is all about green and blue hues which add character to the otherwise predominantly brown hues of the sterile winter. Spring time along the Rio Grande in northern New Mexico. On the Cochiti shoreline with my Necky Dolphin kayak. By late spring, the water warms up enough to go swimming! Chilling at Cochiti Lake on a fine day in May. Rocks, dirt and shrubs is what New Mexico is all about. The snow and water carve through the landscape creating fascinating formations. The rebirth that spring brings to the sterile feeling New Mexican winter is particularly exciting to a Floridian like me. Florida is always green, always blooming, there is no winter (but there are two seasons – wet & dry). It really does feels like a fountain of youth, always fresh, always warm. It’s worthwhile to move away to gain an appreciation for cooler and different climes and also back for the gift that Florida offers! Although my time in New Mexico has long passed, it has a feel of a kind of timeless place. Florida always feels like a place in the moment, with no history or future. New Mexico is the opposite. You can feel the age of the landscape as the seasons leave their marks in sediments along the river. The regular changing of the seasons is an endless cycle with slight variations each time. 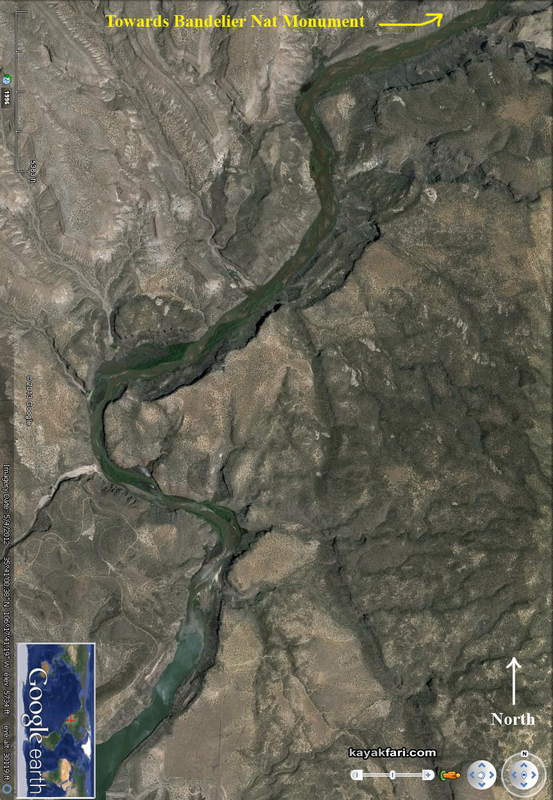 In the spring when the snow melts and the rivers start flowing, flooding is always a possibility and I have personally witnessed water levels increase 30+ feet on the dammed Rio Grande! Forms of the New Mexican landscape. Fruiting shrub on a hillside in northern New Mexico. A gorgeous California or Bredow’s Sister (Adelpha bredowii) butterfly lands on my finger. Unlike Florida where water is everywhere all the time, it is actually a precious commodity in the land locked high desert of New Mexico. Most rivers are not navigable and consequently riparian rights do not exist for the paddler. Private and Pueblo land (Native) properties can block access and block streams with fences. New Mexico is not a place where you get around on rivers, another complete opposite of Florida. This means that it can be difficult or impossible to run entire rivers and plan trips. It also means that people’s attention is focused mostly on land travel, thus I really enjoyed the opportunity to see it from the perspective of my kayak on the water! Cacti are endemic throughout the desert southwest region. Wild Cattails coming back to life on the banks of the Rio Grande. An Eastern Fence Lizard (Sceloporus undulatus) comes out to sun on a rock. Swallows nest on the Rio Grande in huge numbers in the spring. Kayaking on this section of the Rio Grande is generally flat water, although the “lake” section is big enough for a good fetch of wind to blow sometimes. This lower open section is favored by sailors and most boaters. The more interesting paddling is done upstream where there are many bends in the river and small seasonal geographical differences due to water level changes and erosion. At over 5000 ft elevation this area gets plenty of sun year round and offers incredible star gazing on moonless nights! Wildflowers everywhere along the riparian zone in New Mexico! Cochiti Lake reservoir and dam on the Rio Grande. It’s been over 40 years since the Cochiti Dam flooded and pooled into this valley. Piñon trees (a type of Pine tree) cover the hillsides of the topography all over the southwest and the flooded dead remnants still ring the perimeter of the “lake”. Their twisted branches make for picturesque and sometimes eerie frames of the landscape. The pine nuts from living trees are harvested and make a delicious addition to all types of cooking! Small sailboats, catamarans and windsurfers are actually pretty popular on the lakes and reservoirs of land locked New Mexico! Layers of clay dirt, spring growth, rocks and sky. I encountered many instances of anthropomorphic formations and driftwood forms! “Wood-b-Predator” – an anthropomorphic driftwood piece that found me! 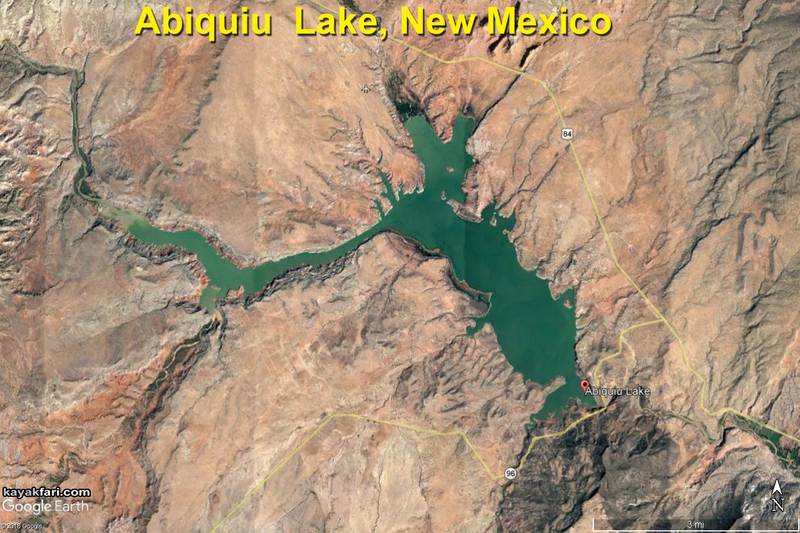 Abiquiu Lake is second closest large body of water near Santa Fe. Like the other reservoirs, this lake was created by damming the Rio Chama, which is a tributary to the Rio Grande. The river is very scenic and popular for rafting and kayaking and I would love to spend some time here in the future! Abiquiu Lake is bigger and attracts more power boaters than Cochiti Lake. The scenery is superb throughout this area and has been made world famous by artist Georgia O’Keeffe. Abiquiu Lake is a reservoir created by the damming of the very scenic Rio Chama. Large Pinon tree driftwood frames the shoreline of Abiquiu Lake. The Big BIG sky over Abiquiu Lake in New Mexico. Beautiful springtime in northern New Mexico at Abiquiu Lake! Road access to Abiquiu Lake near the dam. Scene further upstream along the banks of the Chama River in northern New Mexico near the Monastery of Christ in the desert . The Continental Divide runs along the mountain ranges a little to the west, so it feels like paddling on top of the (North American) world. All the water drains east into the Gulf of Mexico and then the Atlantic Ocean and Caribbean Sea! 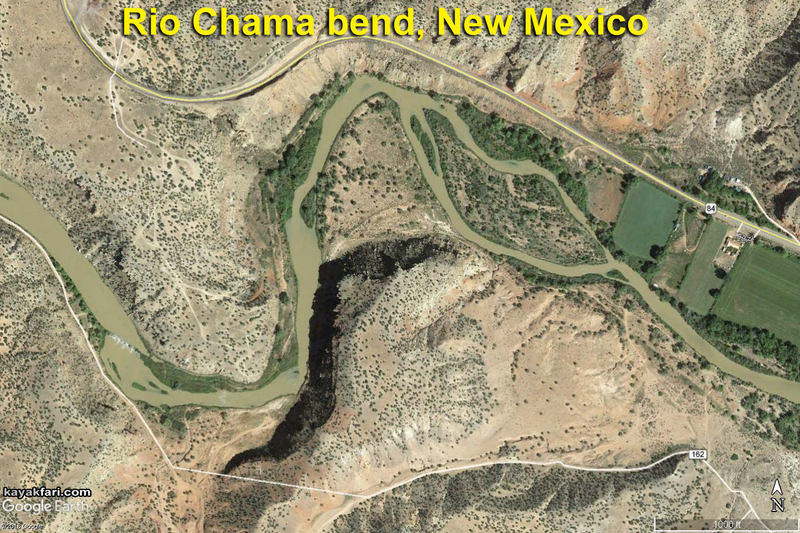 The bend in the Chama River just past the Abiquiu dam. Taking a break kayaking on the Rio Grande in northern New Mexico. Late afternoon on Cochiti Lake. Northern New Mexico is an interesting place and Cochiti Lake has spoken to me many times through the seasons. In the springtime when water levels are high you can paddle upstream on the Rio Grande right up next to Bandelier National Monument! Spring cycle on the timeless Rio Grande! Wet and earthy riparian zone on the Rio Grande. Upstream on the Rio Grande towards Bandelier National Monument is where the best paddling is! Mud flats on the Rio Grande. A big dose of the famous New Mexican late afternoon sun and landscape beauty! And now for some riparian entertainments! A clear night in northern New Mexico on Cochiti Lake. Full moon over Cochiti Lake on a tiny island. Lighting up the night in northern New Mexico. On the east bank of Cochiti Lake there is a tiny island . At the time it had one lone tree on it and I dubbed it the “Burning Bush”. It was a small tree, maybe five feet tall, and always looked scraggly as on the verge of dying. Amazingly over the seasons it eventually prospered even through floods and drought! “The Burning Bush” – in the high desert. Bless! That freaked me out a little bit! Sipping on the sweet nectar of the night under a full moon I fall asleep ..
and enter the dream state. Other aliens played for me in my dream. The nights out on the high desert are chill and quiet, save for distant or maybe not so Coyote calls. There are no background noises but you can always listen to the wind! I awoke and was mesmerized by the shimmering moonlight over Cochiti Lake. I hope you’ve enjoyed this lil photographic journey through New Mexico’s rich riparian springtime on the Rio Grande and Abiquiu Lake!